A lovely & romantic gift for Valentine's Day, Sweetest Day or as a wonderful anniversary gift. Express your true feelings of love and snuggle up close together with this warm and toasty Embroidered Blanket made with from the heart. Your Embroidered Heart Fleece Blanket is a 100% polyester, 6.5 ounce fleece black blanket. Tone-on-tone black decorative whipstitch around the outside of the blanket. Size: 50" x 60". Includes FREE Embroidery. 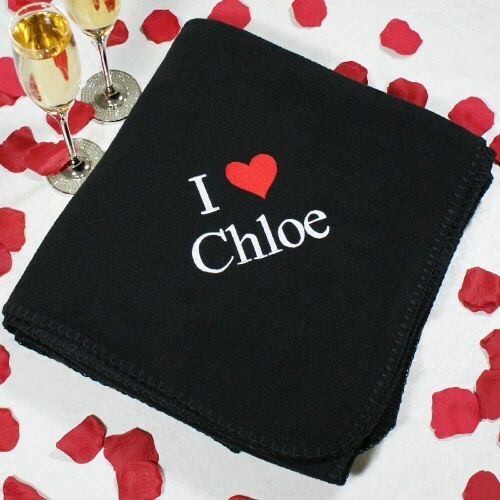 Personalize your I Heart You Valentine Blanket with any name. Additional Details 800Bear.com has many Valentine's Day Gifts for romantic evenings spent together. From Embroidered Blankets to cute and cuddly Custom Printed Romantic Keepsakes. We have the right gift for the love of your life. Be sure to give a Personalized I Love You Bear to your sweetheart as well.